President Donald Trump has a plan to defeat radical Islamic terrorism off the battlefield, judging from the publicly available evidence. The plan is simple, if extraordinarily ambitious: Reform Islam. More specifically, the aim is to induce Muslim leaders to reject jihad and terrorism, and to embrace and promote a moderate practice of Islam. Trump’s public calls for an end to Islamic terrorism made headlines, but largely unnoticed has been a larger and concerted plan to reform Islam by eliminating the root cause of such violence: the extremist ideology that fuels jihad. The president appears to be coordinating an effort to that end with a new kind of Arab leader, Saudi Crown Prince Mohammad bin Salman, who is said to admire Margaret Thatcher. Just one month before Salman assumed power by becoming the heir to the Saudi throne, Trump called upon Muslim leaders to fundamentally reform Islam by rejecting terrorism and global jihad during his landmark speech in the Saudi capital of Riyadh on May 21, 2017. “There can be no coexistence with this violence. There can be no tolerating it, no accepting it, no excusing it, and no ignoring it,” the president insisted. “When we look a back at President Trump’s legacy 10 to 20 years from now, there’s going to be two events that have historic significance above all else,” says former deputy assistant to the president, Sebastian Gorka. “With regard to the latter,” Gorka added, “it really needs to be understood as a catalytic moment in history. As one Arab woman told me just a few days after he gave the speech, ‘This is what we’ve been waiting for, for 17 years,’” apparently referring to the terrorist attacks of Sept. 11, 2001. 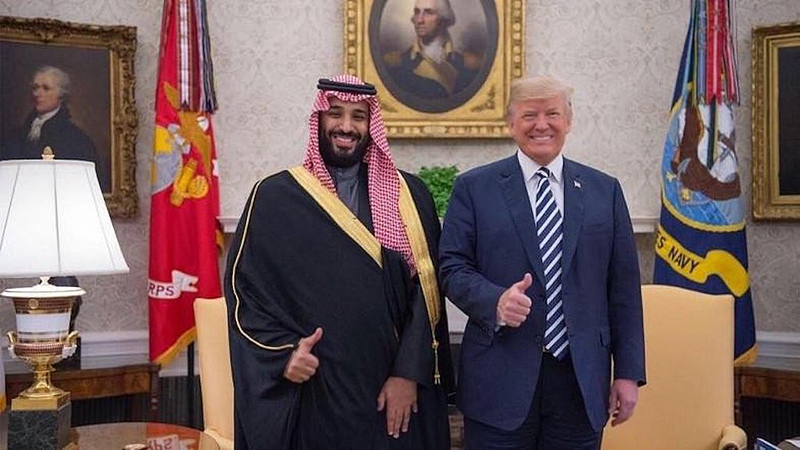 Salman became crown prince on June 21, 2017, exactly one month after Trump’s speech, and since then appears to have become a key partner with the White House. According to the New York Times, “it is widely believed” that Salman is coordinating details of the administration’s Middle East Peace plan with Jared Kushner, senior adviser to the president and Trump’s point man on the project. Salman might seem an unlikely reformer because members of the Saudi royal family have long been suspected of supporting and financing Islamic terrorism. Saudi Arabia is also the source of Wahhabism, an austere and repressive form of Islam thought to inspire a jihadist movement in the 1990s led by Osama bin Laden. But, this prince is a different breed of Saudi leader. Salman hasn’t just pledged to rid the world of Islamist terrorism. He has also called for wide-ranging reforms to moderate the practice of Islam in his country and around the world. And he has begun instituting those reforms in Saudi Arabia. Salman reportedly shocked a group of American Jewish leaders in March by saying that it was time for the Palestinians to negotiate peace with Israel “or shut up and stop complaining.” He then shocked the Arab world in April by stating that Israelis “have the right to have their own land.” That statement is believed to be the first time a Muslim leader has ever publicly affirmed Israeli’s right to exist. “We want to lead normal lives, lives where our religion and our traditions translate into tolerance, so that we coexist with the world and become part of the development of the world,” he announced. To accomplish all this, Salman has had to battle against his own deep state, powerful factions in the royal family and the Saudi government under the influence of Wahhabi clerics who want to see a repressive and bloody sharia remain the supreme law of their land. The prince may be winning that battle, as the Washington Post ran a story in June headlined, “Saudi Arabia’s once-powerful conservatives silenced by reforms and repression.” The paper reported that the country’s “most conservative Islamists are reeling from a loss of influence,” and that fundamentalist clerics have been jailed. Prince Salman did not have a real ally in the White House until the election of Trump. “In late 2015, Prince Mohammad (Salman) attended a meeting between King Salman and U.S. President Barack Obama, where the prince broke protocol to deliver a monologue criticizing U.S. foreign policy,” reported the New York Times. The paper said the prince would routinely lecture senior American officials, including the president. Salman was reportedly angered by what he saw as the failure of Obama’s policy in Syria and his warming of relations with Iran. The prince was particularly incensed over Obama’s comment that Saudi Arabia must “share the neighborhood” with Iran, the world’s biggest sponsor of state terrorism and the kingdom’s mortal foe. In sharp contrast, Salman and Trump were all smiles when they met at the White House in March. Trump began by stressing he would avoid the interventionist mistakes of his predecessors, saying that America would not seek to impose our way of life on others. Trump particularly emphasized that only by defeating the ideology that “drives” terrorism could the Mideast achieve peace. That would be a historic achievement. Many scholars, analysts and politicians have argued that radical Islam can never be defeated military, primarily because its appeal is too widespread and too deeply ingrained among millions of Muslims. Many have long believed Islam will have to change itself to bring an end to global jihad. He argued that Islam will not purge itself of radical fundamentalism until the religion is reformed, as were Christianity and Judaism, to become tolerant enough to coexist peacefully with other faiths. But the reform of Islam has seemed unlikely because few Muslim leaders have been brave enough to publicly challenge the jihadists’ medieval morality. Now, Salman is doing just that. And his call to end Islamic terrorism is backed by Trump. If their efforts succeed, it could result in an epic sea change in global politics. Gorka put into perspective just why the president’s Riyadh speech to the Arab world was such a watershed moment and why his growing partnership with a new generation of moderate Arab leaders is such a historic opportunity. — Trump’s Plan to Change the World originally appeared at To The Point News.